Promoting diversity in both wildlife habitat and fruit varieties is a guiding principle of Rama Farm. Beginning with one kind of peach and nectarine, we now have several varieties of apricots, peaches, nectarines, and grapes. Orange flesh, medium to large size, fresh eating dessert, available in early July. 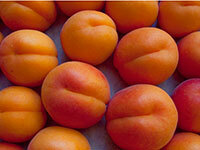 Orange flesh, smaller size, great fresh and for preserving, available in late July. Yellow-flesh, freestone, great for fresh eating and best for preserving, available in September. Yellow-flesh, easy to pit, great for fresh eating, available in August. White-flesh, freestone, great for fresh eating, preserving, available in September. Yellow-flesh, freestone pit, great for fresh eating and preserving, available in September. Blue-black seedless grape, medium-large clusters with large berries. Grapes are available in September. Seedless grape, medium clusters with small red berries.